McCafé Espresso’Clock Promo - Hello! Welcome to my blog! This July 13-17, McDonald’s gives customers more reasons to celebrate each new day with the McCafé Espresso’Clock promo. Just purchase any breakfast value meal from 8:00-9:00 AM to upgrade your meal drink to a Small (8oz.) 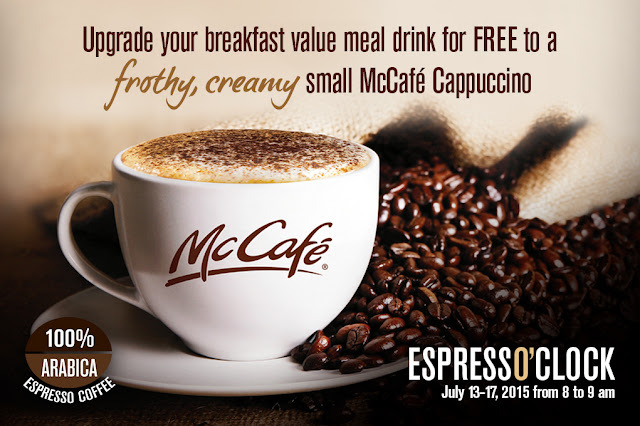 McCafé Cappuccino – free of charge! This creamy, rich espresso drink topped with hot frothy milk and sprinkled with chocolate powder is just the treat to make one’s day extra awesome. The promo will run from July 13-17, 2015 at select McDonald’s stores nationwide via dine-in and take-out. For a list of their participating stores. Check them out here.